Both the hydroxide ion and the weak acid are not present at equilibrium. The only ionic species left, the O2CH−, is basic, and so the solution will be as well. 3. 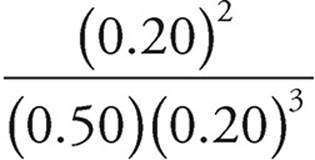 D The number of moles of base is staying the same, and so is the concentration of the acid. Therefore, the same volume of that acid will be needed to get to the equivalence point. 4. A A buffer is made up of an acid and its conjugate base. The conjugate base of HCO2H is CO2H−, which is present as the anion in the NaCO2H salt. 5. B The ideal buffer will have a pKa close to the pH of the buffer solution. The Ka of formic acid is 1.8 × 10−4, meaning its pKa will be in the 3-4 range. 6. C The equilibrium expression is always products over reactants, so that eliminates (A) and (B). 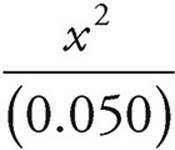 The coefficients in the balanced equation turn into exponents in the expression, leading us to the correct answer. 7. B To speed up the reverse reaction, we are looking to cause a shift to the left via Le Châtelier’s principle. If the pressure were to increase, there would be a shift to the side with fewer gas molecules, which in this case means a shift to the left. All other options cause a shift to the right. 2.0 < 8.1, so the reaction must shift right in order for the reaction to proceed to equilibrium. This would cause an increase in the rate of the forward reaction, along with a decrease in the [SO3]. 9. C Changing the amounts of either reactants or products present will not cause a change in the equilibrium constant (nor would changing the pressure, if that were an option). The only way to actually change the value of the constant is by changing the temperature. As this is an exothermic reaction, adding more heat would cause a shift to the left, increasing the amount of reactants, and thus the denominator in the equilibrium constant expression. This, in turn, reduces the value for Kc. 10. A Using ΔG=ΔH − TΔS, we can see the value for ΔH is negative, which promotes a negative ΔG and thus favorability. ΔS would be positive because there are more moles of gas molecules present after the reaction. A positive ΔS leads to a negative TΔS term, which also promotes favorabiilty. 11. D The solubility of a substance is equal to its maximum concentration in solution. For every AgCl in solution, we get one Ag+ and one Cl−, so the solubility of AgCl—let’s call it x—will be the same as [Ag+], which is the same as [Cl−]. So for AgCl, Ksp=[Ag+][Cl−]=1.8 × 10−10=x2. 12. D The best conductor of electricity (also called the strongest electrolyte) will be the solution that contains the most charged particles. HNO3 is the only strong acid listed in the answer choices, so it is the only choice where the acid has dissociated completely in solution into H+ and NO3− ions. So a 0.1-molar HNO3 solution will contain the most charged particles and, therefore, be the best conductor of electricity. 13. C Ksp is just the equilibrium constant without a denominator. 14. D For BaF2, Ksp=[Ba2+][F−]2. For every BaF2 that dissolves, we get one Ba2+ and two F−. 15. C The Ba2+ ions and the SO4− ions will combine and precipitate out of the solution, so let’s find out how many of each we have. To find the number of moles of SO4− left in the solution, subtract the moles of Ba2+ from the moles of SO4−. Now use the formula for molarity to find the concentration of SO4− ions. Don’t forget to add the volumes of the two solutions. 16. D Use the formula for Ksp. For every SrF2 in solution, there will be one strontium ion and two fluoride ions, so [Sr2+] will be 1 × 10−3 M and [F−] will be 2 × 10−3 M.
17. C The Cl− ions from the two salts will both be present in the solution, so we need to find the number of moles of Cl− contributed by each salt. To find the number of moles of Cl− in the solution, add the two together. Now use the formula for molarity to find the concentration of Cl− ions. Don’t forget to add the volumes of the two solutions. 19. D The solubility of a substance is equal to its maximum concentration in solution. For every PbS in solution, we get one Pb2+ and one S2−, so the concentration of PbS, 3 × 10−14 M, will be the same as the concentrations of Pb2+ and S2−. 20. D According to Le Châtelier’s law, the equilibrium will shift to counteract any stress that is placed on it. If the temperature is decreased, the equilibrium will shift toward the side that produces energy or heat. That’s the product side where I2 is produced. 22. D According to Le Châtelier’s law, equilibrium will shift to relieve any stress placed on a system. If the temperature is increased, the equilibrium will shift to favor the endothermic reaction because it absorbs the added energy. In this case, the equilibrium will be shifted to the right, increasing the concentration of both K+ and NO3− ions. Changing the volume of the solution, (A) and (B), will change the number of K+ ions in solution, but not the concentration of K+ ions. Because solids are not considered in the equilibrium expression, adding more solid KNO3 to the solution (C) will not change the equilibrium. [Cl2]=[SbCl3]=0.1 M, and [SbCl5]=(1.0 − 0.1) M=.99 M.
We can then say that K=(0.1)(0.1)/.99=.0101 which is most closely approximated by choice (D). When all of the values are plugged into the expression, (A) is the only choice that works. 26. D Use a table to see how the partial pressures change. 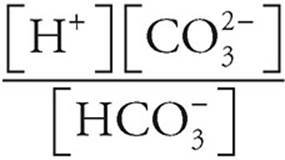 Based on the balanced equation, we know that if 2 atm of CO(g) were formed, then 2 atm of H2O(g) must also have formed. We also know that the reactants must have lost 2 atm each. Now plug the numbers into the equilibrium expression. 27. B Every mole of Sr(OH)2 dissociates to produce 2 moles of OH− ions, so a 0.10 M Sr(OH)2 solution will have a [OH−] of 0.20 M.
The solution will be neutralized when the number of moles of H+ ions added is equal to the number of OH− ions originally in the solution. 28. B You can eliminate (C) and (D) by using common sense. HBrO is a weak acid, so an HBrO solution will be acidic, with a pH of less than 7. To choose between (A) and (B) you have to remember that HBrO is a weak acid. 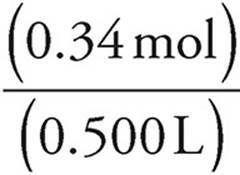 If HBrO were a strong acid, it would dissociate completely and [H+] would be equal to 0.01-molar, for a pH of exactly 2. Because HBrO is a weak acid, it will not dissociate completely and [H+] will be less than 0.01-molar, which means that the pH will be greater than 2. So by POE, (B) is the answer. 29. C The best buffered solution occurs when pH=pKa. That happens when the solution contains equal amounts of acid and conjugate base. If you want to create a buffer with a pH of 5, the best choice would be an acid with a pKa that is as close to 5 as possible. You shouldn’t have to do a calculation to see that the pKa for choice (C) is much closer to 5 than that of any of the others. 30. C An amphoteric species can act either as an acid or a base, gaining or losing a proton. HCO3− can act as an acid, losing a proton to become CO32−, or it can act as a base, gaining a proton to become H2CO3. 31. D We want to change the hydrogen ion concentration from 0.1 M (pH of 1) to 0.01 M (pH of 2). The HCl is completely dissociated, so the number of moles of H+ will remain constant as we dilute the solution. So, V2=10 L, which means that 9 L must be added. 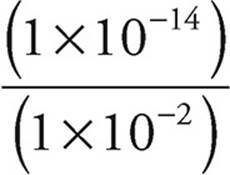 For every HA that dissociates, we get one H+ and one A−, so [H+]=[A−]=1 × 10−5. 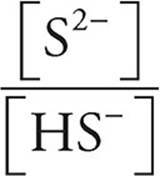 The acid is weak, so we can assume that very little HA dissociates and that the concentration of HA remains 1-molar. Ka = = 1 × 10−10. 34. D First let’s find out how many moles of H+ ions we need to neutralize. 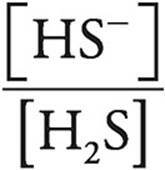 Every H2SO3 will produce 2 H+ ions, so for our purposes, we can think of the solution as a 0.4-molar H+ solution. 35. D Every unit of HNO3 added to the solution will place 1 unit of H+ ions in the solution. So first find the moles of HNO3 added. Now it’s easy to find the H+ concentration. 36. B The reaction here is NH3+H+ NH4+. 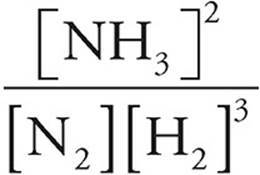 At equilibrium, the moles of NH3 and H+ would be equal, leaving behind NH4+ ions, which will then donate ions to water, creating an acidic medium. 37. D At the equivalence point, the moles of acid is equal to the moles of base. = 1, and log 1=0. So, at the half-equivalence point, pKb=pOH. The equivalence point is at V=15.0 mL, and at V=7.5 mL the pH is about 9.5. The pOH (and the pKb) of the base is thus 4.5. 39. A The reaction occurring is NH3+H+ NH4+. During the first buffer region, all added hydrogen ions immediately react with NH3 to create NH4+. NH3 remains in excess until equilibrium is achieved. 1. (a) The solubility product is the same as the equilibrium expression, but because the reactant is a solid, there is no denominator. (b) Use the solubility product. One mole of calcium hydroxide produces 1 mole of Ca2+, so the concentration of Ca(OH)2 must be 0.01 M.
(c) We can find [OH−] from (b). (d) Find the new [OH−]. The hydroxide already present is small enough to ignore, so we’ll use only the hydroxide just added. Now use the Ksp expression. 2. (a) Entropy increases when a salt dissociates because aqueous particles have more randomness than a solid. (b) Most salt solution processes are endothermic, and endothermic processes are favored by an increase in temperature. Therefore increasing temperature will increase the solubility of most salts. (c) In an endothermic reaction, the energy is part of the reactants. Increasing the temperature would thus shift the reaction to the right. (d) The solution was already saturated, which means [Na+] and [Cl−] were already at their maximum possible values. If the volume of water decreases, the number of moles of Na+ and Cl− present in solution must also decrease in order for their concentrations to remain constant. In order for that to happen, some of the sodium and chloride ions present will form a precipitate, increasing the mass of NaCl(s) present. 3. (a) Use the equilibrium expression. (b) Use the equilibrium expression. From (a) we know that [H+]= = 1.5 × 10−4. (c) (i) Adding HCl will increase [H+], lowering the pH. (ii) From Le Châtelier’s law, you can see that adding NaHCO3 will cause the first equilibrium to shift to the left to try to use up the excess HCO3−. This will cause a decrease in [H+], raising the pH. You may notice that adding NaHCO3 will also cause the second equilibrium to shift toward the right, which should increase [H+], but because K2 is much smaller than K1, this shift is insignificant. (iii) Adding NaOH will neutralize hydrogen ions, decreasing [H+] and raising the pH. (iv) Adding NaCl will have no effect on the pH. (c) (i) An increase in temperature will shift the reaction to the left, causing an increase in the H2 concentration in the short term. The temperature increase also causes an decrease in the value for the equilibrium constant. A smaller equilibrium constant means the species in the denominator of the mass action expression will be present in increased concentrations at equilibrium, so [H2] will remain increased. (ii) An increase in volume favors the direction that produces more moles of gas. In this case, that’s the reverse direction, so the concentration of H2 will increase in the short term. However, an increased chamber volume will eventually reduce the concentrations of all species at equilibrium, as the number of moles remains constant and concentration is calculated using moles/volume. Thus, [H2] will decrease by the time equilibrium re-establishes. (iii) Adding N2 will initially shift the reaction right, and the concentration of H2 will decrease. However, by the time equilibrium is re-established, there will be more moles of all three substances in the container, so ultimately [H2] will be increased. 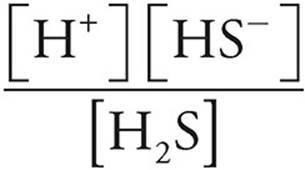 (iv) The addition of He, a gas that takes no part in the reaction, will have no effect on the concentration of H2. 5. (a) Use the equilibrium expression for H2S to find [H+]. 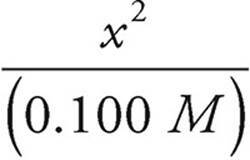 Let’s assume that 0.100 is much larger than x. That simplifies the expression. Let’s look at the Henderson-Hasselbalch expression. 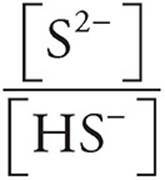 When pH=pK, [HS−] must be equal to [H2S], making equal to 1 and log equal to 0. Let’s find out how many moles of H2S were initially present. We need to neutralize half of that, or 0.025 moles, so we need 0.025 moles of NaOH. (c) The concentrations of the H2S solution and NaOH solution are both 0.100 M, so the first 500 mL of NaOH solution will completely neutralize the H2S. The final 300 mL of NaOH solution will neutralize HS− molecules. Initially, there were 0.050 moles of H2S, so after 500 mL of NaOH solution was added, there were 0.050 moles of HS−. Every unit of NaOH added neutralizes one unit of HS−, so when all the NaOH has been added, we have 0.030 moles of S2− and (0.050 moles) − (0.030 moles)=0.020 moles of HS−. Now we can use the Henderson-Hasselbalch expression to find the pH. We can use the number of moles we just calculated (0.030 for S2− and 0.020 for HS−) instead of concentrations because in a solution the concentrations are proportional to the number of moles. (b) This is a buffered solution, so we’ll use the Henderson-Hasselbalch expression. First let’s find [NH4+] and [NH3]. When we mix the solutions, the volume becomes (0.100 L)+ (0.080 L)=0.180 L.
Now we can use the Henderson-Hasselbalch expression for bases. (c) First let’s find out how many moles of NaOH were added. So for every unit of NaOH added, one ion of NH4+ disappears and one molecule of NH3 appears. We can use the results of the molar calculations we did in part (b). Now we can use the Henderson-Hasselbalch expression. We can use the number of moles we just calculated (0.005 for NH4+ and 0.021 for NH3) instead of concentrations because in a solution the concentrations will be proportional to the number of moles. (d) When equal quantities of a base (NH3) and its conjugate acid (NH4+) are mixed in a solution, the pOH will be equal to the pKb. pH=14 − pOH=14 − 4.75=9.25. 7. 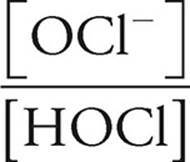 (a) The hypochlorous acid will donate its proton to the hydroxide. The sodium ions are spectators and would not appear in the net ionic equation. (b) At the equivalence point, the moles of acid is equal to the moles of base. (c) This calls for an ICE chart. We will first need the moles of both the acid and base. 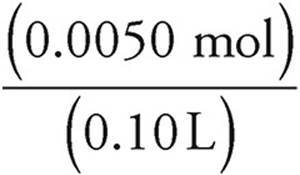 (d) (i) If additional NaOH is added, that would mean a larger number of moles of NaOH added to the flask, and thus more apparent moles of HOCl would be present at the equivalence point. More apparent moles of HOCl would lead to a larger numerator in the acid molarity calculation and thus a larger apparent molarity. As the student’s calculated molarity was too low, this could not have caused the error. (ii) If the buret was not rinsed with the NaOH prior to filling it, the concentration of the NaOH would be diluted by the water inside the buret. The student would then have to add a greater volume of NaOH to reach equivalence. However, in the calculations, using the original concentration of NaOH multiplied by the higher volume would lead to an artificially high number of moles of NaOH and thus, more apparent moles HOCl at equivalence. More apparent moles of HOCl would lead to a larger numerator in the acid molarity calculation and thus a larger apparent molarity. As the student’s calculated molarity was too low, this could not have caused the error. (iii) If the student did not add enough acid to the flask, that would cause the denominator in the molarity of the acid calculation to be artificially high. This, in turn, would make the calculated acid molarity be artificially low. This matches up with the student’s results and could be an acceptable source of error.